Raquel and Marco are designed by Daniel Gattig. Raquel is the top part and Marco is the subwoofer, that is positioned below. 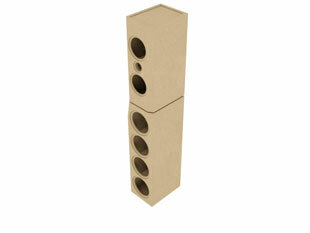 Both together form a floorstanding loudspeaker. Each subwoofer is made up of two subwoofers and two passive radiators. The crossover consists of a second-order filter for the two bass loudspeakers. The two mids woofers got a bandpass filter of second order. For the tweeter a third order high pass filter is used. In addition two notch filters smoothen the frequency response. The frequency response of the speaker-system is flat till 20 000 Hz on axis; the decay spectrum is excellent. The non-linear distortions remain almost consistently below 0.4% at 90 dB SPL above 120 Hz. The kit with high-end crossover contains ClarityCap capacitors, except a 330 uF capacitor which consists of 3 electrolytic capacitors and one ClarityCap PWA capacitor in parallel. In series to the tweeter capacitors of type ESA are used. Baked varnish core coils and one copper foil coil replace the standard air core coil.